ROGER KEAN discovers that the games warrens are full of Rabbits — and they’re breeding fast! With the games software revolution recovering from its Christmas hype it is easy to forget just how short a time ago the whole thing started. After all, many of the better known software houses were only formed 8 to 10 months ago which makes RABBIT a grand-daddy, having now clocked up almost two years in the business. 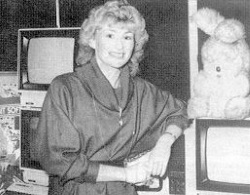 The company’s mascot is director Heather Lamont’s cuddly toy, Roland Rabbit, whose floppy-eared form adorns the distinctive red cassette boxes which have long been familiar to Vic-20 owners. Heather Lamont and the company mascot, Roland the Rabbit. Rabbit recognised the potential of the Spectrum and began producing games for it three months ago. The six titles have sold very well, but their low advertising profile means they are not as visible as many other software houses. ‘The Spectrum programs are very good and we should be known for them,’ John added. Nevertheless, Heather Lamont reckons they sell 60,000 cassettes a month during the low summer season, a figure undoubtedly improved over Christmas. Rabbit started life as an offshoot of Cream Computers, a shop in Harrow (North London) that specialised in business micros. One of the employees wrote software, and it was in the time when personal computers were in their infancy. It seemed like a good idea to sell some games by mail order. It was. ‘We started off doing our own duplicating.’ said John, ‘with very basic packaging — cream coloured paper with a rabbit stamped on it and hand written details.’ The idea took off, coinciding with the buzz about the Vic-20 and soon Cream had to start thinking seriously about their young Rabbit. The first thing was to realise that computer games were going to be big business for shops, something the chain stores were reluctant to recognise initially. Rabbit hired in a tele-sales team and began zapping away. The results were encouraging, to say the least, which is why their games are now available from all good computer outlets, Smiths, Menzies, Boots, Laskys, Martins, Rumbelows and Greens of Debenhams to name a few. Rabbit now has less dealings with the public direct, preferring to concentrate on helping the retailer sell the product through production of posters, stickers and an excellent all-colour catalogue. The packaging of the cassettes has improved radically too, with colour artwork on the inlays and the whole cassette sold inside a larger red box stamped with the Rabbit logo. The marketing exercise is all aimed to build up a name for high quality programs. Terry Grant — responsible for overseeing Rabbit’s programmers. Although they wrote their own software in the early days, Rabbit no longer has in-house programmers, but they do have several under contract with whom they keep in close contact. Terry Grant is the software producer/director. His task is to think up the ideas and work with the programmers. He decides on details like skill levels and character definition, and generally oversees production. He seems very young to hold such a responsible position but then, this is a young business, run by young people, and encouraging young people where it can. Their early success in selling games resulted in floods of programs from young hopefuls. ‘We still get several programs a week sent in’, Terry told me. ‘We help the writers along, even if the programs are outdated in concept. ‘A problem is that a lot are written in BASIC and need compiling to speed them up.’ Rabbit help in this way, and sometimes a saleable game comes out of the effort. The results, as far as Spectrum games go, is impressive — six games in a short space of time. There is the fiendishly mean ESCAPE MCP where you are pitted against the micro processor of your Spectrum, lost in the circuits and trying to evade capture; the road race game RACE FUN; a ‘galaxian’ style game called PHANTASIA; their excellent version of FROGGER; a particularly fast creepie-crawlie CENTRAPODS; and the quirky QUACKERS — a fair ground duck shoot. These six have been joined by further games since Christmas. ‘The main thing,’ John firmly told me ‘is to have an original program. Originality is the way the market is going.’ But originality comes to nothing if the product is not available for sale and duplication of tapes is the biggest headache at the moment. Chain stores are getting very worried about the situation because after accepting a title they are finding that the software producer has difficulty in maintaining stocks. Heather Lamont and John Willan have now formed a new company called Copy-Soft. The two directors have invested large sums of money in the latest American high quality duplicating equipment. Copy-Soft is quite separate from Rabbit and will offer a full scale service to all software houses, including inlay design and printing, right through to bulk copying and delivery. Rabbit won’t receive preferential treatment it seems, but it must be nice for Copy-Soft to know they’ll be handling at least 60,000 cassettes a month right off! Rabbit’s sales manager, John Willan. He feels that Prism have overlooked the fact that games players want to keep the programs they buy. The Romox system Prism wants to use was tried in the America — and it failed, John maintains. Part of the problem is that you buy a game and then take the cassette back later to have it over-recorded with another program, which means you can’t ‘revisit’ a game later without paying again. Another problem is the simple fact that software houses have worked hard to create an identity for themselves through their cassette inlays, and with the Prism system all you get is a blank cassette. John Willan, Heather Lamont, Terry Grant and Roland Rabbit think that the customer’s best protection from second-rate games is to buy from software houses they know. At the moment the best guarantee of quality is provided by the entire packaging of a game. It seems natural that software houses who care about their product should want customers to know who made the game. Meanwhile, Rabbit are looking towards new warrens to conquer.